The Kalamazoo/Battle Creek International Airport opened in the late 1920’s. The airport initially provided passenger service to Grand Rapids, 33-miles to the north, as well as air mail service. A control tower was built in 1961. At its peak, in the early 1990’s, the passenger terminal accommodated more than 500,000 annual passengers; in 2012, this figure was down to roughly 250,000 passengers. Passenger service is provided to three large hubs. American Airlines offers commuter hops to Chicago (KORD); Delta/Northwest Airlines offers commuter hops to Minneapolis (KMSP) and Detroit (KDTW). The number of annual airport operations has declined significantly. A peak of 109K operations in 1999 fell 59% to 45K operations in 2012. FAA data shows the airport averaged 124 operations per day in 2012, which equates to four takeoffs per hour for the 17-hrs of daily air traffic control. ATC is provided by FAA personnel, and includes local TRACON services. 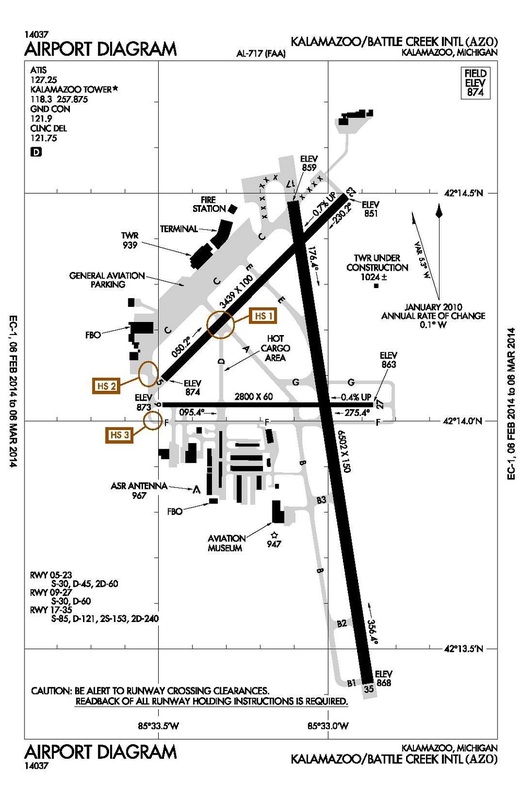 The nearest controlled airport is the Kellogg Airport in Battle Creek, just 14-miles to the east. FAA compiles ATADS data for this facility. Airport operations in 2012 were DOWN 27% vs. 2007 operations, and DOWN 59% from the peak year (1999). …Kalamazoo/Battle Creek International Airport has a brand new terminal, a new tower is under construction and work is planned to improve the smaller terminal used by private and corporate planes. Now the F.A.A. has approved a grant request for over $625,000 to spruce up the runways. …An analysis by NATCA, subtitled: ‘How Sequestration Will Affect the Flying Public and the U.S. Economy’. The table in the last pages lists Kalamazoo as facing closure, but it also lists many much busier facilities. It appears the list was compiled to create maximum public concern.